Oh I am so stinkin' excited about this Interview! When I read Prada & Prejudice I couldn't stop thinking about what a FUN book it was. I knew I wanted to try and get an interview with Mandy. Anyone who could write a fun regency/contemporary style book like that, I knew we needed to talk to her! She said Yes! How SWEET for us!! 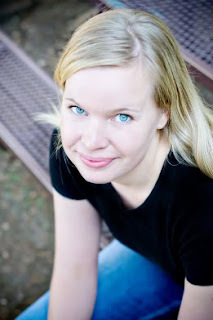 Let me introduce you to Mandy Hubbard author of Prada & Prejudice! How did you come up with the idea for Prada & Prejudice? Long story short: Love Regency romances for the setting, love contemporary romances for the voice. So I combined them both to create a book I would love to read. I feel Callie is like most of us girls in high school trying to fit in. Did you have any similar experiences as Callie? I did—I was definitely self-conscious in school, always second-guessing myself. I tried really hard to act like I wasn’t shy so I would pretend to be confident but then not really talk to anyone. The combination made everyone think I was actually a stuck-up snob! I only discovered as an adult that people actually did like me, but they thought I was full of myself or something since I never talked to them. Oops! You know, I really like them all for various reasons, but I think Victoria is a really interesting character. She doesn’t get as much screen time as the others, but I sure hope people know and like her by the end of it. Do YOU own any Prada shoes? Did you enjoy designing Callie's wardrobe? Of all the dresses she wears, which is your favorite? Oh, definitely! It would be so amazing to wear the dresses Callie wears. The two ball gowns are my favorite. I think I lean toward the white one. It has a dusty-rose ribbon under the bustline, and she wears white gloves with it. I think it would look incredible in real life! What is your favorite quote from your book? It’s her trying to convince herself that she can pull off pretending to be Rebecca, and it’s a turning point for how the rest of the story unfolds. Pride and Prejudice by Jane Austen is a favorite among readers throughout the world, how did it influence YOUR book? In the first draft, it had no influence whatsoever. The title was a different then too. But the more we were rejected, the more it became clear that the editors wanted Pride & Prejudice to influence my book. When I scrapped the whole thing and started over, I went in trying to emulate a few more of the themes of Pride & Prejudice without outright ripping it off. I think I was able to achieve a good balance. People have liked that they could spot some moments that mirrored Austen’s classic, but also that the story was new and different. What can you tell us about your upcoming novels? My June 2010 novella for harlequin is called DRIVEN, and its about a twenty-year old (female) mechanic who falls for a pit crew member on a rival team. My next novel for young-adults will also be out Summer 2010, and all I can say for now is that it’s a fun high-concept romantic comedy. I should be sharing the title/cover/summary in the next month or two on my blog and website, so stay tuned! The Season by Sarah Maclean (Romantic! ), A Match Made in High School by Kristin Walker (Laugh out loud funny! ), The Chosen One by Carol Lynch Williams (Heart breaking! ), True Confessions of Charlotte Doyle by Avi (unforgettable! ), Pride & Prejudice by Jane Austen (duh! )…I could basically go on forever, so I’ll stop here. Is there anything else you'd like to tell The Sweet Bookshelf readers? I <3 hearing from readers/fans, so if you read Prada and Prejudice, don’t forget to tell me what you think! THANKS MANDY!! We wish you all the best in your career and can't wait to read what's next! Great interview. I just love the question about the relationship between Pride and Prejudice to her book ;) I can't wait to read it! Good interview questions. I haven't read this yet but I'm putting it on my TBR list to read.